Learn more about the workshop costs, payment information, accommodations and frequently asked questions. Tamarack has secured sponsors to help us offer this learning event at a reduced cost. Tamarack is a charitable organization and, as such, we do this work within our means. This Gathering, and the development of the learning community, represents our hope that this will be a mutual experience shared by both the learner and the sponsors. In this spirit of mutuality, the cost for participation is, therefore, also shared. Attendees of previous Gatherings have confirmed our own experience, that the learning from these events is better translated into action when a group of learners from the same collaborative attends together. Therefore our costing provides subsidies to encourage colleagues to enrol together. Your fee includes: three days of onsite learning, all lunches, gourmet breaks, and experiential learning tours. 1. PayPal - to pay using your credit card via PayPal, simply register, select "Pay Online" as your payment method and follow the prompts to submit your payment online using PayPal. You will still receive an invoice for your records. 2. Credit Card - to pay using your Master Card or Visa over the phone, please register and select to be invoiced for your registration. Then, email Jana to set up a credit card payment appointment. We are pleased to be able to offer subsidies to colleagues who enrol together. To register a group, please have one member of your group complete the registration form. On this form there is space to select the number of people attending and add the names of all attendees. If you have special group registration needs, please reach out to Glenda. We know that you don't want to miss out on this exciting learning event, but understand that sometimes unanticipated changes can affect your plans. This is why we have a cancellation policy that allows us to refund your registration fee up to 4 weeks in advance of your workshop date (less a $150 administration charge which we need to put towards our overhead costs.) Starting 3 weeks prior to the workshop, we are sorry to say we can no longer offer registration refunds, but will gladly admit confirmed substitutions up to 1 week in advance of the workshop so that someone else can benefit from the training. Tamarack hosts a number of single and multi-day learning events annually. These learning events are designed to provide participants with theoretical knowledge and practical tools that community change leaders can utilize in their work. The Be A Light Scholarship initiative is designed to support individuals and/or groups to participate in a Tamarack Learning Event. The Tamarack Scholarship can only be applied to the registration portion of the Learning Event. Any additional costs incurred to attend the Tamarack Learning Event, including travel, hotel, and incidental costs must be covered by the individual and/or their sponsoring organization. To apply for a scholarship, fill out the application form below. Deadline to apply is April 26, 2019. The workshop will be held in the iconic landmark hotel, Chateau Lacombe, located in the heart of downtown Edmonton. 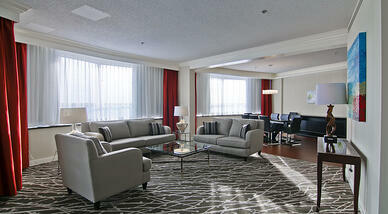 It offers spectacular panoramic views of the North Saskatchewan River valley. The closest airport to Chateau Lacombe Hotel is the Edmonton International Airport (YEG) and is 35km from Edmonton's business district. Each afternoon you will also be invited to hop onto a bus for an experiential learning excursion where we will combine tours and lectures from speakers who actually do the work of ABCD daily. We will bring together a diversity of individuals from a variety of sectors, and we encourage participants to enrich this gathering with their own unique experiences, gifts, and the issues and ideas that matter to them the most. Participants represent: citizen leaders, community organizations, associations, businesses, funders, researchers and staff and elected officials from national, provincial/state, regional and local governments. We will send you pre-reading materials before you arrive and we will update the site regularly with new resources and related learning opportunities prior to the event. Who is taking care of my travel and accommodation? Participants are required to book and pay for their own travel and accommodation in Edmonton. Here at Tamarack, we're working hard to make sure your experience at the gathering is an enjoyable one. If you have any questions, contact Glenda.